This is just a quick post- I was going to just post this on Facebook (if you’re not following there, you should! I’m going to base giveaways on FB followers!) but decided to just do it here. I hadn’t been to ULTA in about a month- which is LONG for me- so I stopped in today while the oldest was at preschool. 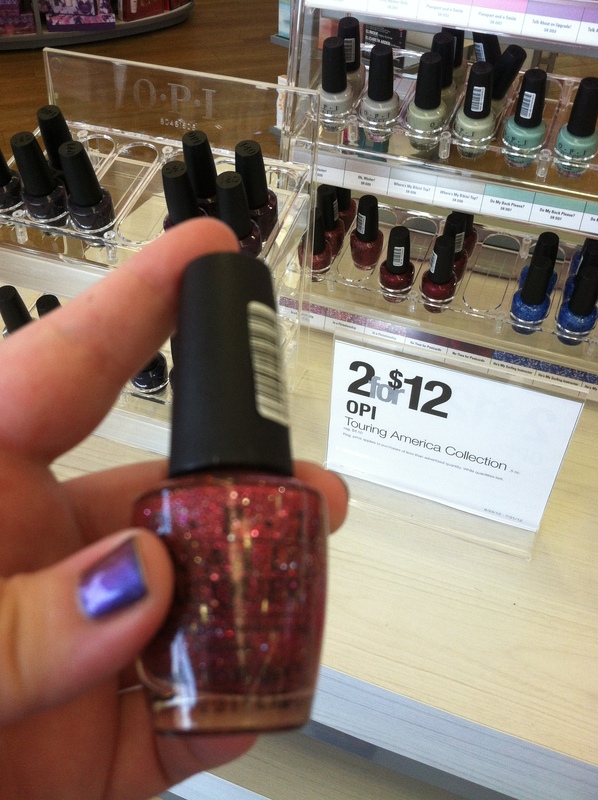 Right in the front, there was a large display of ‘Summer Exclusive 2012’ colors by O.P.I. Now, at first I was confused. When I was in here only 1 month ago, they had the ‘Summer Exclusive’ colors- and it was just 4, and none of these. Karen of Frazzle and Aniploish did a great writeup of them here, along with the identical Nicole by O.P.I. twins. I already owned the NOPI You + Me = Blue, so I picked up Hot Fun in the Summer-Lime (it stained my nails badly- they’re still stained). Now here we have 12(!) colors and no sign of those original 4 in my store. I’m assuming it’s like this at every ULTA, but they don’t display O.P.I. online so I can’t confirm that. So the REAL reason this display interested me- was the polish that’s nestled right there on the bottom row, left side. Can’t see it well? I got a closeup! Yeah, I didn’t realize my phone did a cruddy job with this photo or I would have taken more- maybe. The manager was looking at me a bit strangely as I snapped pictures of their displays. It’s O.P.I.’s Excuse Moi!, repackaged as ‘In A Flirtationship’! Since I just featured this last week and had a few people lamenting that it was no longer available- it’s available again, at least for a little bit! This is the 2nd repackaging of this polish (It also appeared for ULTA’s Holiday collection this year), so it may not make a 4th appearance. Grab it while you can if you want it! As expected, every single one of the colors is a repackaging of past O.P.I. collection colors. If you’re interested, here’s what each polish is (as far as I can tell). New name: Old Name (Collection). These go from L to R, top to bottom on the display. They’re listed as 2 for $12, though the manager at my ULTA was telling me that the original ‘Buy 2 OPIs get 1 Exclusive Free’ still applied. I saw no sign to verify that though. Regardless, $6 for an O.P.I. is a good price! If you want to head in and pick a few up, take this 20% off coupon with you! There’s a lot of pretty re-released colors there, and they’re a bit cheaper than normal- good chance to grab any you may have missed! This entry was posted on June 28, 2012 by The Polish Monster. It was filed under Uncategorized and was tagged with Excuse Moi!, O.P.I., ULTA. I found your blog while searching for details on one of the Summer Exclusives I bought, Do My Back Please? I haven’t been able to find it anywhere, which I think is strange – I think it’s a dupe of Thanks a Windmillion (Holland), which I just had on my toes, and that No Time For Postcards (which I also bought) is a dupe of Meep Meep (Muppets)! Anyway, I’m glad to know that I’m not crazy and that others saw this collection in their Ulta, too. You know, I was there last week- and the display was already gone!! I hadn’t bought anything from it the day I took this photo, and when I went back to get some it was gone and the girl working at the register didn’t even know what I was talking about.